Jeff and I love our beautifully restored home. We do not, however, love Portland anymore. I wish we could pick up our house and put it someplace else, but that's not possible. Ever since our last property tax bill, we've been contemplating a move. This week we've started poking around property listings in a few different cities. We're still pretty casual in our efforts. We don't know if or when we'll move, but we've started exploring our options. On Saturday, we drove down and visited Sandy, Oregon. It's a small town not far outside of Portland. 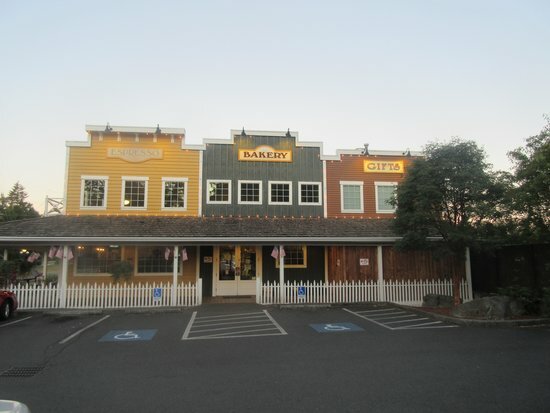 It was a nice little town with some cute Western-themed facades along their main business route. I wish I'd remembered to bring a camera. Here are a couple of photos I swiped from a google search. 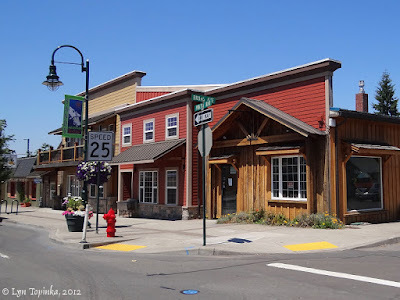 We're also planning to look at Springfield and Prineville, Oregon. If we find the right house, or the right lot to build on, we might just make the jump. I left Portland in summer of 2007 to move closer to family. Traffic was bad and the time was right, though I had lived there for 30 years and didn't think I would ever leave. I moved to NE Alabama, 4 miles from my sister, brother-in-law and elderly mother. We are out in the country, though country is not as peaceful as you might think. It's beautiful here but a different mindset, so there are pluses and minuses. I can never go back - way too expensive. I knew that when I left, thank goodness, so no regrets though I do miss the proximity to the ocean. I hope you find a good place to settle. I hope you find a good place, too. However, it will cost a lot of money and time to move....those real estate tax savings will take many many years to make up what it will cost to move. It's more than just property taxes. It's the crime and homeless problems too. And it would be nice to have a house with a bedroom on the same floor as the common area. Stairs are getting harder for my aging body.